Use this pouches for cosmetics, perfume, jewelry, pencils. It’s the perfect bag organizer or use it on the go as a clutch to hold your phone, charger, credit cards and various other essentials. 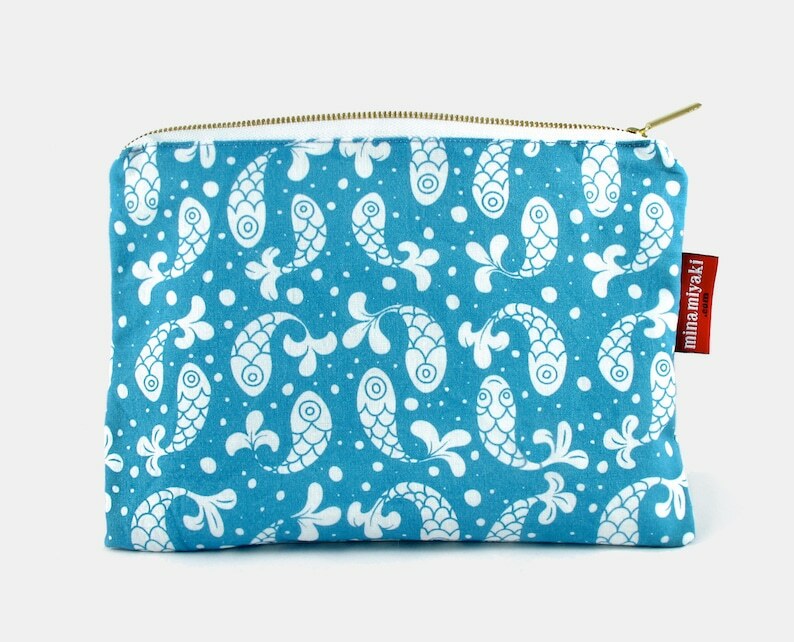 Same fabric and print on this pouch but with a flat bottom: http://etsy.me/1R16868. Unique and beautiful piece. The fabric has a nice, solid weight to it, and I love the bold graphics! Lovely and simple. Perfect size—holds lots of stuff! I want you to be fully satisfied with every item that you purchase in my shop. If you are not satisfied with an item, you may return it within 30 days of receipt of the items. You will receive a full refund of the purchase price, minus shipping. Just send me a message. All items must be in original condition and in their original packaging. Laundered items will not be accepted. Holiday Shipping Cut Off Dates to receive your items by Dec. 24th is Dec 19th. The shop will close from Dec 22nd to Jan 2nd. Once shipped you will get an email with your order's tracking number. For USPS First class shipping to the US, costs vary from $2.6 for one pouch to $3.54 for the Nolita Crossbody bag. And from $9.45 to $13.70 internationally. Those estimated prices are for shipping one item only. The quickest way to evaluate shipping costs is to add the desired products to your shopping cart and enter your shipping information to calculate exact shipping costs. All pouches have either the flat design or trapeze design (with a flat bottom). However they greatly differ in their choice of fabric, which makes them all different. I am using different fabrics for both the exterior (Kona Cotton, Polyester canvas, Cotton/Linen blend, Polyester Faille) and interior lining (some are water repellent canvas, or regular polyester canvas). Each listing indicates when the items ship. Some bags are shipped the next business day up to 3 days after you put in your order. Feel free to contact me if you have a special request. Ownership and Copyright of the artwork remains with the artist, all rights reserved.